Whether or not you’d describe yourself as an organised person, I bet you’ve experienced that very pleasing sensation of having tidied out a kitchen drawer. You’ve chucked out all of the broken pens, thrown away all the scrappy bits of paper and receipts that you thought you might need one day. The half-finished, out of date packets of chewing gum and Polos are now in the bin and you have located the Sellotape, scissors and stamps that you suspected had been lost forever. Doesn’t it feel good? Now, imagine that feeling multiplied by 100. That’s what happens when you organise your wardrobe. We get dressed at least once every day. We launder our clothes and rehang them regularly. We buy new things and rehome them in our wardrobes every so often. (Some more often than others). Basically, you are in and out of your wardrobe many, many times a day/week. When your wardrobe is clutter free and you have a system for how things are ordered (light colours to dark/ smart wear to casual wear…or whatever works best for you), choosing what to wear each day becomes quicker and easier and somewhat more pleasurable. Putting the clean clothes away becomes less of a chore and when you can see what you already have, you are less likely to keep on buying more of the same (by accident). Items that are worn several times a week. Pieces that are worn occasionally. Clothes that have never been worn. One of the reasons that items of clothing are barely or never worn is that they are shoved in between other more colourful or eye-catching pieces and you forget they are there. Another reason is that you aren’t sure what they go with or whether they fit, or whether you even like them. Whatever the reason, it’s all fixable. And it’s SO worth spending even a teensy bit of time getting it straight. As we move into Autumn and the temperature drops, the clothes you reach for on a daily basis will be very different from what you’ve been wearing over our lovely long summer. The shops are full of beautiful, colourful pieces, a new catalogue drops through your letterbox weekly (or daily if you are like me!). You decide it’s time to add some more season appropriate clothing into your wardrobe. You start browsing online, you add a few bits to your wardrobe here and there. Before you know it, your wardrobe is bursting at the seams, cosy knits snuggled up close to your summer dresses. Sandals falling out of the wardrobe every time you rummage around at the back to find a pair of more weather appropriate shoes/boots. It’s a bit stressful, it feels hectic and its slowing you down. This is the perfect time to get organised. Take stock of what you already own, make conscious decisions about what you really need this season and plan your ideal wardrobe. 3 Easy Steps To Wardrobe Nirvana. Remove out of season pieces (including footwear and handbags). Store them in lidded boxes or zipped bags under your bed, in the loft, in the spare room. Anywhere that is out of sight will do. 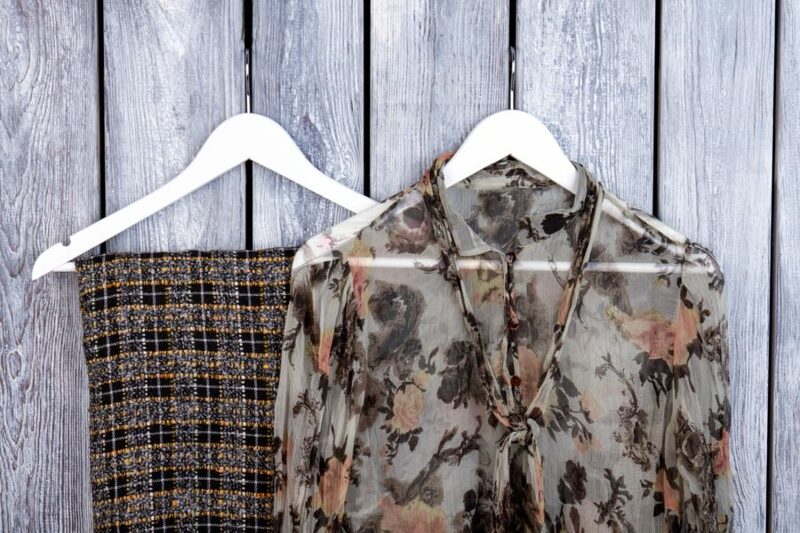 Hang all your clothes in categories, (skirts, trousers, tops, jackets) and within a category hang pieces from light to darker colour. This not only looks very appealing but (more importantly) makes it quicker and easier to find what you are looking for and to be inspired to wear something different to the norm. Remove all your spare hangers. If you buy something new, you have to make space for it by removing something else. One in, one out. If you haven’t had a good, honest look through your wardrobe recently. Now is the time. You will feel SO great afterwards. Next week I am running a free online style class to help you plan your new season style, so once you’ve had a clear out and you know what you want you need, you can build up the perfect clothing collection for you and your lifestyle. Register here and tell your friends. Let’s get organised together! It’s happening on Tuesday 9th October at 12pm-1pm. Register here.